The London Array is the world’s largest offshore wind farm – and it looks even more amazing from space. NASA Earth Observatory just released these beautiful images of the array, which is located off the coast of Kent in England. The images show the vast expanse of the wind farm, which pumps out around 630 megawatts of energy each year. The London Array opened less than a year ago, and it was installed by Denmark’s DONG Energy, Abu Dhabi’s Madsar and Germany’s E.On<. Spanning across the water, the wind farm consists of 175 Siemens 3.6 MW turbines that are equally spaced in a grid. Together, the wind turbines generate enough energy to power 470,000 homes. When operating at full capacity, the ambitious project can prevent 925,000 tons of CO2 from entering the atmosphere. NASA’s surreal pictures look more like an abstract painting than an image of the earth. Tiny points form a grid across an expansive swirl of aqua, white and blue. 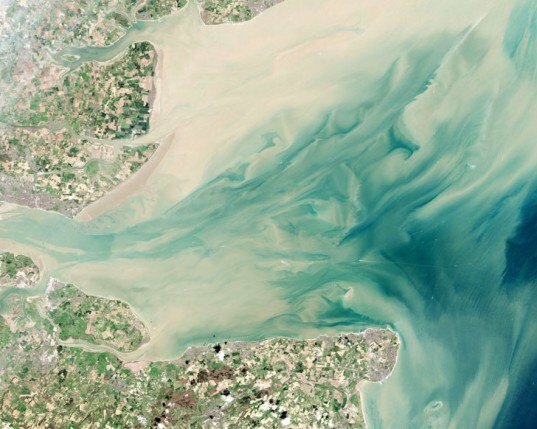 Compared to the nearby Kent shoreline, the images give viewers an idea of just how far the wind farm’s reach extends. The array, which was first proposed in 2000, was built in just under two years before opening on April 8, 2013. The wind farm beat the existing Greater Gabbard site, which generates 500 megawatts of energy on the East Anglian coast. Images via NASA Earth Observatory and DONG Energy A/S.